In Centurion, Ravichandran Ashwin had shown glimpses of how he can be a strike bowler when pacers are unable to get breakthroughs. CHENNAI : In Centurion, Ravichandran Ashwin had shown glimpses of how he can be a strike bowler when pacers are unable to get breakthroughs. In England with Dukes ball, he showed how he had shed the tag of being a defensive bowler on foreign shores.Now in Adelaide on Friday, with his team in the need of wickets, Ashwin showed that he has very much buried the notion that he can only be useful in home conditions. The end result? India can fancy taking a lead — a slender one, but a lead nonetheless — as Australia are still 59 away from the visitors’ first-innings total of 250. Going forward, he will have a bigger role to play. So what has changed from the Ashwin of old, who was considered not good enough to be a first-choice option in SENA (South Africa, England, New Zealand and Australia), to being a go-to spinner now? Perhaps with age, he has understood himself better. Previous tours of those countries had left Ashwin with more questions than answers. He learnt them the hard way, and by picking the brains of bowling coach Bharathi Arun. One of the many good things about India’s current bowling unit is that they now see the big picture of contributing to the overall cause. This is where Ashwin has benefitted from the tours to South Africa, England and Australia this year. Unlike previous occasions, Ashwin now has the cushion of coming in to bowl after pacers have given him an opening. That allows the off spinner to exert further pressure without worrying about the scoreboard. On Friday, India’s speedsters hadn’t made the kind of inroads their Australia counterparts had made on Day 1. Ashwin was summoned as early as the 12th over. The visitors needed him to find his rhythm early. They needed Ashwin to be the enforcer, one who dictates the terms. He did, enjoying all the attention that came with it. In the past, Ashwin has been guilty of bowling too full and quick, a fact that has come from the horse’s mouth himself. That wasn’t the case on Day 2; adjustments in pace were made and the batsmen were left guessing. The brilliant set-up of Marcus Harris’ bat-pad dismissal was one outcome of that. Ashwin got drift going both ways, which led to batsmen playing from the crease and in line with the stumps. That gave him the wickets of Shaun Marsh and Usman Khawaja. Even before landing in Australia, Ashwin knew that adjusting his pace would be key. According to Cricviz, during India’s previous tour of this nation in 2014-15, only 54 per cent of Ashwin’s deliveries were slower than 87kmph. On Friday, 75 per cent were slower than the said mark; a factor that allowed him to get the said drift. India first innings: (overnight 250/9)Shami c Paine b Hazlewood 6, Bumrah not out 0. Extras (lb 1) 1. Total (10 wickets, 88 ovs) 250. Bowling: Starc 19-4-63-2, Hazlewood 20-3-52-3, Cummins 19-3-49-2, Lyon 28-2-83-2, Head 2-1-2-0. 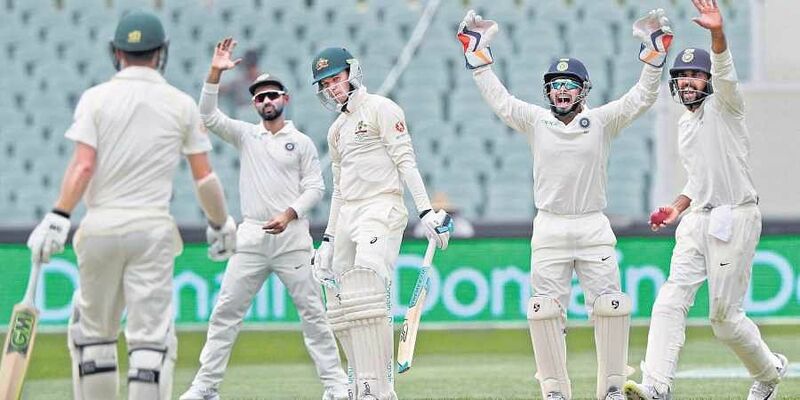 Australia 1st innings: Finch b Ishant 0, Harris c Vijay b Ashwin 26, Khawaja c Pant b Ashwin 28, Marsh b Ashwin 2, Handscomb c Pant b Bumrah 34, Head (batting) 61, Paine c Pant b Ishant 5, Cummins lbw b Bumrah 10, Starc (batting) 8. Extras (lb 9, b 6, nb 2) 17. Total: (7 wickets; 88 ovs) 191. FoW: 1-0, 2-45, 3-59, 4-87, 5-120, 6-127, 7-177. Bowling: Ishant 15-6-31-2, Bumrah 20-9-34-2, Shami 16-6-51-0, Ashwin 33-9-50-3, Vijay 4-1-10-0.